The National Union of Teachers are taking strike action on Tuesday over cuts to education, nationally agreed terms and conditions for ALL schools and negation of a reduction of teachers workload as promised by Secretary of State for EducationÂ Nicky Morgan. The March begins at 10.30am in Manchester city centre – start point All Saints Park, Oxford Rd, Manchester followed by aÂ Rally at 12.00 noon in Piccadilly Hotel, Manchester. The Government’s new Education for All Bill continues to show they have the wrong priorities for teachers, schools and children. As more schools become academies, the coverage of the national STPCD and Burgundy Book will narrow and these protections will gradually wither away. Real term cuts in funding will have major effects on schools and teachers, whether academy or maintained. This will further erode terms and conditions, increase workload and impede pay progression for teachers. 91.7% of members in England who voted have voted to support ‘discontinuous strike actionâ€™ against cuts in funding and for genuine negotiations around our workload, pay and other conditions. For advice on all aspects of going on strike on 5 July – and for advice on the situation in Wales – please see the FAQs. The NUT has written to the Education Secretary outlining the reasons for the strike and asking for meaningful discussions to resolve the issues that are negatively affecting education. Under the UK’s union laws action must be started within 28 days of the ballot closing. There is no option of simply delaying action. Each school will see, on average, a cut of 8% in funding, so our strike action is vital to keep pressure on the government. We are calling on Nicky Morgan and George Osborne to commit to investing in education, not cutting it. In the meantime, please support our strike. Details of rallies and marches in your area can be found here. 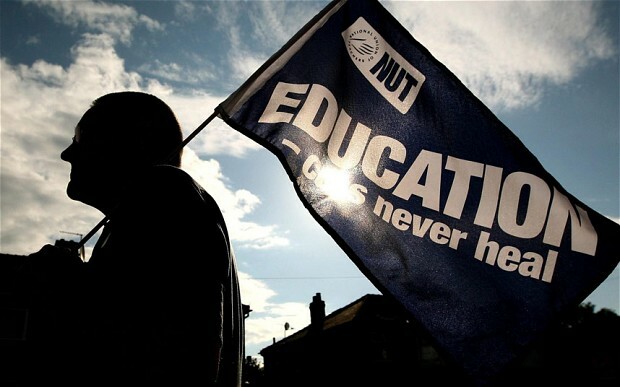 The NUT is asking the Government not to implement the real terms cuts that will affect ALL schools. Primary schools and small, or rural schools suffer disproportionately when funding is cut, and even academies will be hit hard.